COLUMBUS, Ohio (AP) — Ohio State trustees on Wednesday began discussing the future of football coach Urban Meyer with Meyer and later Meyer’s wife seen entering the building where the meeting was underway. Board Chairman Michael Gasser briefly called a meeting to order before the board went behind closed doors to consider whether Meyer should be punished for his handling of domestic abuse allegations against a former assistant coach. The investigation centers on what Meyer knew and did about allegations of abuse against former wide receivers coach Zach Smith, who was fired July 23 after his ex-wife sought a protective order. Courtney Smith alleged her husband shoved her against a wall and put his hands around her neck in 2015, one of several alleged domestic incidents involving the couple. The Smiths separated in June 2015 and divorced in 2016 and Zach Smith has never been charged criminally for abuse. “Countless hours have gone into conducting and supporting this comprehensive review,” Gasser said as the meeting opened. Meyer arrived at Longaberger Alumni House on the school’s campus Wednesday morning, where the meeting was being held, about an hour after it started. His wife, Shelley, entered the building about five hours later, shortly before 3 p.m. Dozens of reporters camped out ahead of time before trustees moved into execution session. No timetable has been given for final resolution of the saga that has overshadowed the team’s preparation for its 2018 season, which begins Sept. 1. Factfinders briefed the board on Monday. The trustees hired an outside law firm for $500,000 to do the investigation, which took two weeks. 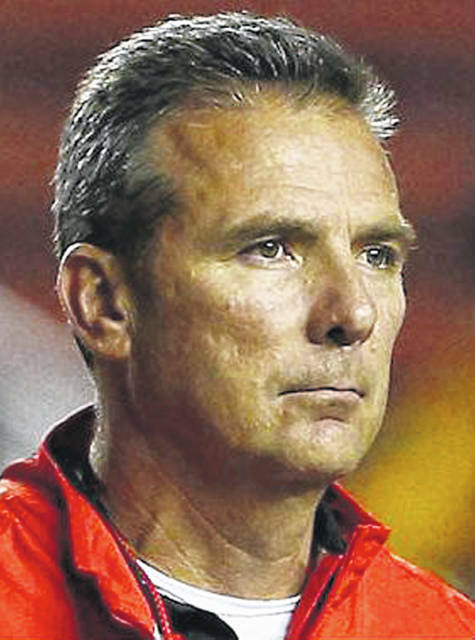 Meyer has said he handled accusations properly when he found out about them, but acknowledged he lied to reporters at first when he said he hadn’t heard of the 2015 incident. Ohio State put Meyer under investigation after Courtney Smith went public, giving a reporter text messages and pictures she traded with Shelley Meyer in 2015. Ohio State is also dealing with a scandal involving alleged sexual misconduct by an athletic doctor in the 1980s and 1990s, and allegations that a former diving coach sexually abused young divers several years ago. On Tuesday, the university announced the creation of a new center to handle and respond to complaints by students, faculty and staff involving sexual harassment and domestic violence.